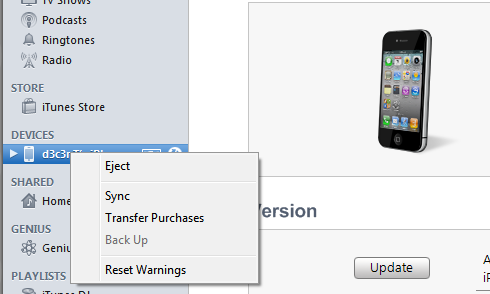 Your iPhone will be visible in the Devices section seen in the left side of your iTunes menu. Right Click for windows and Ctrl + Enter for Mac on your device name. An options box will drop down which will show you the option “Back up your iPhone” which should be selected and this will automatically back up your iPhone completely Contacts, songs videos, notes, Sms conversations and Applications. this will completely Back up your Sms conversations till the time you have synced it to the computer. Note: Backup Files cannot be seen if you have selected Encrypt your Backup while Backing up your iPhone.